HOSTEL Central Station, located right behind the Milano Stazione Centrale, in Viale Lunigiana 4. Recently renovated HOSTEL CENTRAL STATION, offering the guests rooms (single , double, triple and dorm beds) with an ideal location beside the train station, make it easy to be reached from Milano airports , and well connected with milan transportation system taking you easily to city center Piazza Duomo and all importante sightseeing points and museums, as well as Golden Quad Via Montenapoleone where consuming high fashion of the world, Milano Fiera city is also in just few minutes distance by subway. Hostel is in a residence aera, around the hostel, you may easily find the loundry mat, cheap restaurante, internet point, telephone center, supermarket, bar and other services you may need. 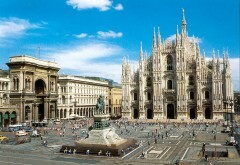 the English speaking staffs are eager to offer you both information inside and outside the hostel, with long years of experience on tourism area, they understand exactly how to make your stop in Milan more pleasure and comfortable. We are in Viale Lunigiana 4, Please press door bell ' Guest House CENTRAL STATION ' in Red Letters, second button from up left. TheHoStel Central Station is located along a quiet side street, only 250 meters away from the Stazione Centrale of Milan, from the Shuttle bus terminal to Maplensa MXP, Linate LIN and Orio al Serio BGY and from the subway station (yellow MM3 and green MM2) for the Rho Milan Expo Area, that in only 5 minutes takes you to Piazza del Duomo. From the hoStel you can easily reach the university and main hospitals (Niguarda and Fatebenefratelli), Piazza Affari (business/financial district), the exclusive boutiques of via Montenapoleone and the shops of corso Buenos Aires. Just a short distance from the hoStel, for those looking for a good time, there's corso Como, filled with the triendiest nightclubs of Milan where famous athletes and television celebrities hang out, or you can have fun in the bars and pubs of the historic Navigli and in the restaurants of the Brera district.